UK insurance company Norwich Union‘s rebranding as Aviva is given a move along with the recently released television commercial featuring high profile entertainers who have changed their names. The company introduced the new name in 2002 to help with the launch of its services outside of the UK. 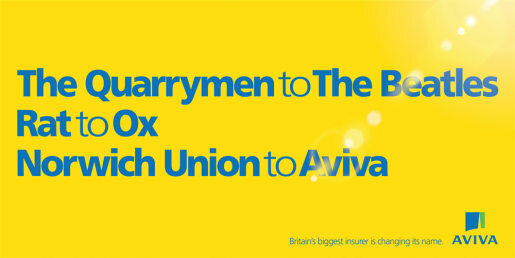 On Boxing Day a six month print, television and online advertising campaign brings the Aviva name back to the UK customers, preparing for the final switchover in June 2009. The first TV execution in the new Aviva advertising campaign features celebrities who have changed their names, before becoming internationally recognized for their talent. A-list stars including Bruce Willis, Elle Macpherson, Ringo Starr, Dame Edna Everage, and Alice Cooper ask themselves: “Would this have happened if my name had been…?” The advert shows celebrities integrated into earlier footage in which they are observing their younger selves. Bruce Willis, for example, talks from the passenger seat of a car chase scene from the movie Die Hard, whilst his younger self is driving the car. Would Bruce Willis have made it as Walter Willis? Would Alice Cooper have achived fame as Vincent Damon Furnier? Or Elle Macpherson as Eleanor Gow? How about Ringo Starr as Richard Starkey? Dame Edna Everidge as just Edna? The Change of Name spot was developed at AMV BBDO, London, by creatives Tony Strong and Mike Durban at created bywith agency producer Anita Sasdy. Filming was shot by director Vaughan Arnell via Serious Pictures with director of photography Nicola Pecorini and producer Donnie Masters. Editor was Bruce Townsend at The Quarry. Post production was done at The Mill. Sound was designed at Wave Studios.